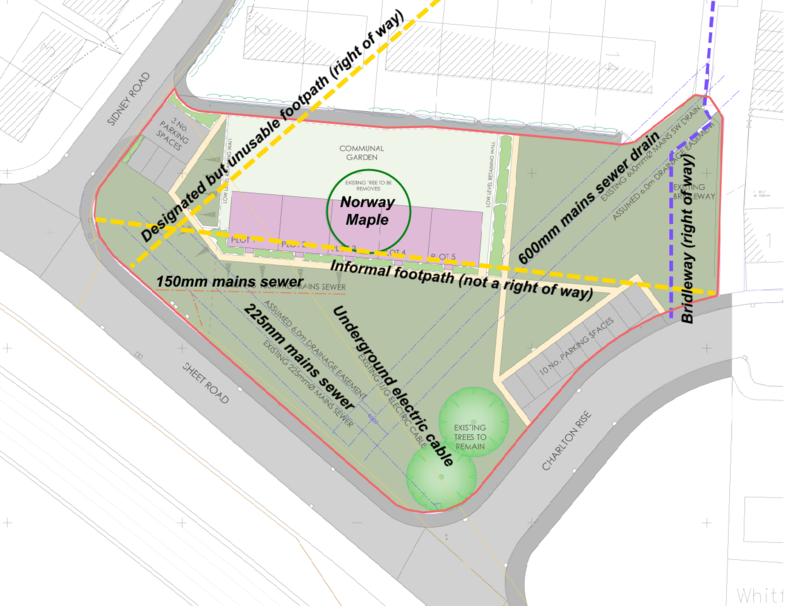 Its been sleeping for a while but next Tuesday, Shropshire Council’s South Planning Committee will decide on whether to fell a Norway Maple and destroy a green space at the bottom of Charlton Rise. The five social housing bungalows off Sidney Road will add to our housing stock. But is it worth the damage to this area of Ludlow? This application is unique in my experience. Almost a full year since the latest plans were submitted, this controversial application for five bungalows is going to planning committee next Tuesday (23 October). The uniqueness does not lie in the application (17/05170/FUL). Final negotiations on the details of developments can be torturous – but our landscapes and townscapes are usually the better for that. This application is unique because not a single word of the paperwork has changed for twelve months. So why the delay? The lag doesn’t seem to lay with Shropshire Council’s planners. More likely it is due to the turmoil within the social housing conglomerate Connexus. This is the body that swallowed up South Shropshire Housing Association and many other housing associations in our area. At least two of the senior officers involved with the Sidney Road project have disappeared without trace. That’s a matter for Connexus. My concern is that we will lose a valued tree and popular green. We will lose open space. The benefit from this scheme will be five more social bungalows. The details are in this previous article. Officers have recommended that the scheme is approved. I will not be voting on this application in the South Planning Committee as I am predetermined. We need a good turn out from residents opposed to the scheme. There is still time to comment on the plans online. Land at corner of Sheet road and Sydney Road – Please no – it’s the only green space on the way into Ludlow – everything else has been swallowed up.. So much for their excuses when the first tree was felled without any consultation or reason whatsoever. We are now being told we must plant more trees, retain more green space – please don’t let this go ahead. I strongly object to this sacrifice of a cherished green area and much-needed tree to provide just 5 bungalows: right in front of a railway line at that. Better solutions have been found with some creative thought – the garages on Rock Lane, now demolished and being replaced by housing, for instance. After all we have been told about the need to preserve open ground to absorb rainfall; to increase tree planting to counter CO2 emissions, and to use built areas in preference to green ones, has nothing been understood by planners? It has certainly been accepted by us who look on at their schemes. This area is already somewhat anonymous due to the similarity of the houses. Killing the tree and removing the grass will just add to the feeling that the local council are not in tune with the inhabitants.